Days of Action and Protest from August 20 to 22, August 2015. Fight against the causes of flight, Stop Arms exports! War starts here in Germany! 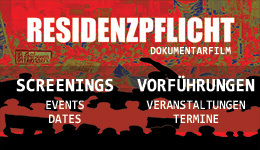 From the August 20 to 22, 2015, the network Refugees for Refugees together with supporting groups, will be protesting and taking action in solidarity with all Refugees against the causes of flight – especially against the German weapon industry, concentrated around the lake of Constance! Together we want to show, that Germany, as one of the leading weapon producers in the world, has a responsibility towards the victims of war and conflict. At the same time we want to emphasize the protest against the European Border Regime and the newly planned strategy to fight migrants in the Mediterranean. The aim is to connect the fight against the causes of flight with the claim for a humane treatment and welcoming of all people, seeking for shelter and safety in Europe. It is sad that the only answer of the European member states to the tragedy in the Mediterranean, is to strengthen their border regime and fight against the smugglers with a military operation. Instead of fighting the refugees, the EU and especially Germany should focus on the causes of flight. Their own responsibility in holding the global South in a relation of dependence and poverty, and in the same time exporting weapons to third countries, should be admitted and finally stopped! The German weapon industry and with it many of the enterprises located on the waterside of the lake of Constance like DIEHL or Krauss-Maffei-Wegmann, is profiting from warfare, no matter whether there is armed conflict in fragile states or armament of the FRONTEX-Border protection. German Weapons, come to the regions of crisis through third countries, and fuel internal conflicts that cause the flight of most of the refugees today. But few refugees manage to get into the fortress of Europe and when they come to Germany, the threat of being deported again to uncertain conditions again is big. We want that the EU and Germany afford the right to stay for everyone and that they finally take their responsibility in the bad conditions in the state of origins. Furthermore, we want to criticize the bad conditions in some of the refugee accommodations in Germany, for example in Goldbach near Überlingen. Simultaneously exchange and discussion between refugees from Baden-Württemberg and their supporters can be developed. Symbolically we want to go in front of the weapon industry located around Bodensee as to show to the public: Even here in the seemingly perfect idyll - death is produced! Basis Camp: Cherisy-Areal Konstanz (Schürmann-Horster-Weg) from August 19 to 22, 2015.